Note: A shorter version of this article originally appeared in American Randonneur, February 2009, published by Randonneurs USA. More Info. All great but somewhat crazy plans start in the pub. 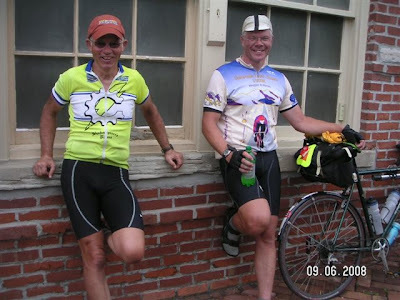 A riding buddy of mine, Bob Fitzpatrick, was on the planning committee for the first stage of the Tour of Missouri (ToM) which started in St. Joseph. 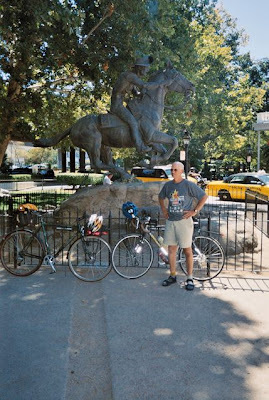 He came up with the idea to tie the Tour of Missouri and the Tour of California (ToC) together. People who are aware of the westward expansion probably have heard of the 18 months in which the Pony Express ran between the two cities before the telegraph took over communication between the east and west. In 1860, Johnny Fry left St. Joseph with mail in his mochilla to be delivered to Sacramento and later, Billy Hamilton was the first to ride eastbound from Sacramento. Wanted. Young, skinny, wiry fellows. Not over 18. Must be expert riders. Willing to risk death daily. Orphans preferred. After a club ride and over a black and tan at the Hi-Ho, Bob ask me if I was interested in a ridiculously long ride from Sacramento to St. Joseph ending at the start of the first stage of the Tour of Missouri. I thought this was a crazy idea as I had just completed an ambitious spring of randonneuring and was planning on taking it easy over the summer. I had developed the Pony Express permanent a few years ago and Robert Fry had recently issued a challenge for RUSA members to attempt one of these epic permanents. I initially laughed off the idea but Bob was persistent. I realized that it was a once in a lifetime challenge and when my family didn’t object, I decided to start training for it. In my mind, I really never thought the ride would happen this year. All along I had planned on attempting the ride alone, however, it didn’t stop me from asking Danny Clinkinbeard from Columbia. He and I have completed many 400 and 600 km rides over the last few years and have always gotten along well. As far as I know, he is the only rider to complete all of the North American 1,200 km rides. He had recently completed the Shenandoah 1200 which had a 50% DNF rate earlier this year. Despite all of his accomplishments, he is very humble and has many funny stories that he tells with his southern accent. His best trait is his ability to remain positive when things appear to be very bleak. I was shocked to hear he was interested. The next thing I knew we had purchased the tickets and were on the ground in Sacramento, California. Danny and I went to Denny’s and had a wonderful breakfast before heading out to the Pony Express statue at 6:30 am for photos and interviews with the ToC representatives. As we rounded the corner, we were both pleasantly surprised that the ToC was set up and waiting for us. Despite planning to start the ride at 7:00 am, we didn’t get done until near 7:30 am. We quickly headed out to the flat American River Bike Trail for the first 30 miles to Folsom. We left the bike trail in Folsom after finding out that Hwy 50 in California does not allow bicycles. 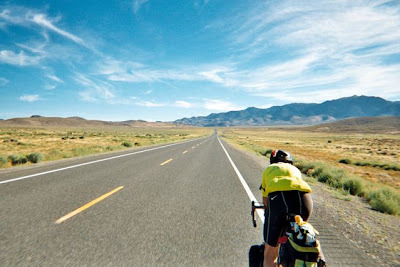 I pulled out my Adventure Cycling (AC) maps and moved to “plan B,:” a much longer route into Nevada. Luckily we started to climb as the heat started to build. After a few hours with temperatures in the 90s, I was glad to have been talked out of that 4 am start. At Pollack Pines (3,900 feet) we stopped for a late lunch and stocked up with food and water before heading out on Sly Park Road. We both had “sour” stomachs and our legs were cramping. The look on Danny’s face told it all despite his upbeat mood. I asked around and got more direct directions to Carson Pass (8,573 feet) than what was depicted on the AC maps. We were warned that there were no services the rest of the way over the pass. In the next five hours we only moved about 20 miles down the road. The Mormon Emigrant Trail was kicking our butts, I was out of food and water but we ran into a mountain biker heading up the mountain. After he saw the fear in our faces, he gave us about two liters of water and informed us that this was one of Greg LeMond’s training routes when he was winning the biggest races in France. I started to feel a little better about having to walk despite a 42x34 gear. I also began to wonder what I was doing here. Me, an overweight fixed gear rider, in the Sierra Nevada mountains. What was I thinking? After a lot of walking, cussing, and grunting we made it to Hwy 88 (8,000 feet). It was now dark and the temperatures were, thankfully, starting to fall. I checked the AC maps and they showed a hotel and a café in Silver Lake, about seven miles away. We plugged on and even got the first downhill coast in about 70 miles. Upon arriving in Silver Lake we were tremendously disappointed that the hotel had closed at 8 pm and that the café was not open. We stopped at an RV park and talked to the manager. He allowed us to fill our water bottles, but kicked us out when I tried to lie down for a micro-nap. He said it was because we were too noisy. The irony of the situation was amazing, since everyone was in their RVs with their TVs on. After collecting myself we headed down the road and napped in the dirt for ten minutes before heading down the road toward Kirkwood. The next five miles seemed to take an eternity. I was long out of food, my thighs burned, and I was dying for a can of soda. Sure, climbing 20 million feet of elevation is fun, but so is pulling out all your wisdom teeth! We slowly rolled into Kirkwood around midnight and found the reported café and inn deserted. The sky was brilliant and clear, but it was hard to enjoy as we were both completely wasted. After a short conversation we decided to end our day here. I pulled out my emergency bivy and found a nice, hard place to sleep. The toilet looked to be about a mile away so I grabbed an empty water bottle and climbed in the bivy. I awakened at 5 am after a few refreshing hours of shivering and cramping inside a tinfoil bag. I packed up my gear and moved to the porch of the Kirkwood Inn where Danny was sleeping and found that it was shielded from the cold wind. I tried to go back to sleep, but I was far too anxious about getting back on the road. My survival mode typically calls for me to pedal as much as possible until I am able to build up a comfortable mileage/time cushion. I woke Danny up at 6 am and he packed up. We split the last of our food (four pieces of cherry licorice) and I filled my belly with water and the contents of a dozen salt packets. Yum, the breakfast of champions! Close to an hour later we finished the last five miles and reached Carson Pass (8,573 feet). I paused and took a photo of the pass, swallowed some water and salt and headed down other side. I was amazed to see my speedometer reading in the double digits as the miles flew by. About ten miles down the road, I saw a sign for a café and slammed on my brakes right in front of Danny. We turned back and were delighted to find the café open. Paydirt! All of the empty plates started attracting the attention of the others in the café. Soon Danny was answering questions about what we were doing as I finished my breakfast and paid the bill. It had to be about the most expensive breakfast for two people that I have ever seen; it was over $30.00, without the tip. We washed up and quickly hit the road, as it was predicted to get hot. Soon we were heading downhill into Nevada. It was amazing how much drier and windier it was on this side of the mountains. We had a nice tailwind and kept moving down the road through Genoa and into Nevada’s capital city, Carson City. As soon as we hit the city limits, Danny let out a scream as he caught site of a McDonald’s billboard. He shifted into high gear and was soon feasting on his standard meal: double cheeseburger, fries, parfait, and sweet tea. I also ate, drank a super big Coke and ingested as many salt packets as possible. We bused our table and quickly got back on our bikes and took Hwy 50 out of town so as to not burn a lot of daylight. US Highway 50 would be the route we took most of the rest of the way across Nevada. It is known as America’s Loneliest Road. It was pretty busy near Carson City but it had a nice shoulder. I learned a valuable lesson today, if you buy a Snickers, you need to eat it right away or else it turns to a liquid with peanuts. We rode 90 miles by 2 pm and stopped for fluids and salt in Silver Springs (elevation about 4,000 feet). I mailed my first set of maps home from the post office and cancelled all the hotel reservations that I had made across Nevada, as we were so far behind “plan A.” I found Danny at the convenience store where the workers told us that it was already 101°F and would continue to heat up until around 5 pm. That was enough to encourage me to wet my jersey and cap, chug two V8s and hit the road. We were both fighting off leg cramps with salt and water. I could tell that I had not even come close to recovering from the toll that Carson Pass put on me. Danny then told me that yesterday was two to three times as hard as the Leadville 100. I have not done anything near as hard as yesterday nor done near as many rides as Danny, so I just tried to put it out of my mind and kept moving down the road. Outside of town we noticed a huge reservoir that was almost totally devoid of water. I later found out that the Lahontan Reservoir was almost empty due to the severe drought in the area. It was an amazing site and an indication about how dry it was in this area. At sunset the temperatures started to drop and we crossed a huge salt flat and a naval base near Middlegate. Just as the sun went down we heard the jets take off and then we saw helicopters, in formation, fly over us and into the next valley. It was an amazing thing to experience. For some reason I felt like I was in a war zone watching it all happen. Near 8:30 pm we entered Middlegate (population 18, nope it is now 17). We were excited to find the bar (built in 1860) still open and an open bunkhouse where we could sleep. The local patrons were amazed when Danny told them of our riding 166 miles today. They gave us a hard time and laughed at Danny’s stories. I could only chuckle over my wonderful hamburger and beer at Danny’s antics. I realized then that choosing Danny to ride with me was the right thing to do. We rose around 5:30 am and were back at the bar trying to get breakfast by 6:30 am. The morning cook was another member of the family running this outpost, but he was much rougher around the edges. He took his time cleaning the grill and reluctantly took our order as we stocked up on food, salt, Coke, and juices to get us the 63 desolate miles to Austin. We were not able to consume our breakfast until nearly 7 am, but were soon on the road. Too bad we had to waste so much daylight waiting for food, but we were learning the lessons of the road: hotels and cafes open when they want and close early. If you are too late, you are going to go hungry and sleep outside. This part of the trip was going to take patience. “Hasten slowly” would be my mantra. The next leg to Austin was a real grind. We had a gradual but steady upgrade and in combination with the cross headwind (out of the NE) we moved much more slowly. My left knee started to ache and I noticed that Danny was having a difficult time walking when he was off the bike. The trail was starting to take a toll on us. We crested Mt. Airy Summit (6,679 feet) and headed down the other side and noticed another cyclist plodding up the hill. Danny quickly crossed the centerline and approached the other cyclist, who we soon found to be one of our close friends, Thomas Faust. He told us he was heading west riding the Lincoln Highway. All of us were amazed that of all the places the three of us could be, we would meet on Hwy 50 in Nevada! We exchanged information on the locations of food, water and lodging and went our separate ways. The joy of the meeting soon turned into frustration as the last five miles into Austin took us over an hour. The town was built on the side of a mountain. We did find a café that was still open at 3 pm and I called ahead to get a room in Eureka. I was lucky to have called because we got the last room at the Best Western (all the other hotels were sold out). We climbed up the switch backs that led us out of town and then climbed three more mountain passes before coming to Devil’s Gate at dusk. Danny was out ahead of me when he started yelling. I soon saw what looked like a long piece of wood on the road. As I got close, it all of a sudden balled up and I let out a scream and swerved to the other side of the road. I had no idea what kind of snake it was, but it was big! This experience taught us that snakes started crawling out at night to enjoy the heat of the pavement. It was a great incentive for us to get off the road before sundown. It was close to 9 pm when we pulled into town and were told that the only open diner would be closing in 10 minutes. That was all the news I needed to get me in the door to order a good meal and a beer. A nice ending to a very tough 135 mile day. The Clink quote for the day: “Damn! We are going to pay for this!” doing 40+ mph down Austin Summit (7,484 feet) earlier that day. Determined to not make the mistakes of the past, I made a reservation at the Boarder Inn near Baker and got advice on the route from a few local residents. I noticed that I was starting to sleep better as the miles stacked up (420 miles so far) and we started getting into our routine. We left town just as the sun started to rise. This morning was much cooler (44°F) but the climb out of town warmed us up quickly. It was extremely barren in this part of the country. We had covered 77 miles on our way to Ely and there was absolutely nothing in between the towns except telephone poles and mile markers. We climbed four passes, but with the temperatures only reaching the low 80s, it was very tolerable. Our day was basically slogging up the pass at about 4 to 6 mph, flying down the other side, crossing a vast basin and then repeating the exercise again and again. The last 15 miles into Ely was almost all down hill. With the wind behind us, it was little piece of heaven. We found a little café, ate lunch and then stocked up for the next 65 miles. This section was going well, but I was having some problems with my achilles tendons. I tried to remind myself to use a lower gear to take some of the pressure off them, but it was hard for a fixed gear guy to remember. We stopped at a bar about half way down the back of Connor’s Pass (7,772 feet) and grabbed a Coke and some salty chips while chatting with the bartender. We learned a lot about the local area from him. It has much more agriculture than we were used to seeing due to the wonders of irrigation. The bartender warned us about the winds in the area and told us the next pass (Sacramento Pass, 7,154 feet) was a pretty long climb and would be worse with the winds. Taking his advice, I bought yet another Coke and stowed it in my saddlebag for a refreshment on the mountain. The bartender was right. We climbed for hours, it seemed that as we would come around a corner, the mountain would keep going up and up. At least the sun was going down and the air started to cool. As I neared the top I heard the rattle of a snake just off the road. I made a mental note to change my shorts that night and I moved to the middle of the road as fast as I could. Damn snakes! I reached the sixth and final pass of the day and enjoyed my Coke while waiting for Danny to join me. We looked down into the desert on the Nevada / Utah border. The contrast between the last valley and the one we were about to enter was amazing as it was so much more barren and the rocks were much lighter in color. We chatted about the pains in our legs and the length of the climb but realized that our bed and supper was somewhere out in that desert. Time to get moving. We awoke at 5 am (now Mountain Time) and packed quickly for our trip across the desert. Today we carried at least two gallons of water apiece as there was nothing until Delta, UT. In the 88 miles we had a major climb up the Confusion Mountains and then climbed another “hill.” I could sense Danny was very nervous about crossing this desert but we were getting an early start and would be riding in the darkness of pre-dawn for well over an hour. As we left, I couldn’t help but notice how amazingly clear the moon and stars were. I kept myself busy watching them and saw cars appear in the distance and slowly come down the mountain. I checked my watch and timed one of the trucks and found that it took more than thirty minutes to get to us. It was going to be a long haul up that monster! We crested the pass just as a huge group of motorcyclists passed us. I looked down into the next valley and it appeared to be even drier than the previous one. We sailed down the mountain and started across the next desert. Despite what Danny thought, I found the area to be very beautiful. It was a very stark beauty and I was a little shaken by all the cow bones and small crosses along the road. It was hard to believe that there were car accidents on these long straight roads. We began to wonder if they were the cyclists that didn’t quite make it across the desert. After enduring long hours of lonely desert roads, mountain views and vast barren lands, we arrived in Hinkley (a few miles outside Delta). It was hard to believe but the inside of the store had to be 10 to 15°F warmer than it was outside. We gorged on our bounty of food and drinks before heading along highly irrigated farmlands into Delta. At this point we were doing well on time and despite all the excitement that Danny had about the golden arches, I stopped at a diner and had a wonderful Mexican lunch. It was an excellent meal that was served quickly. I then headed to the library across the street to check e-mail and communicate with the civilized world. Danny eventually dragged me out after I reserved a hotel in Eureka, UT. This was the first time that we started to hear about all the construction in the Eureka / Salt Lake area. The locals said that this was the new suburb area for Salt Lake and questioned my desire to go to Fairfield, UT. The day was heating up but I was well stocked with fluids and food. I stop in Lynndyl and got some of the worst convenience store food of the ride. When I tried to eat the mini-donuts, I about broke a tooth. The rest of the food was so stale that I am amazed that they could sell it and remain open. The gentleman at the convenience store also told us the section to Eureka was “flat” to “rolly.” Since we diverted from the Adventure Cycling’s Western Express maps after Ely, we were just relying on general road maps that didn’t include elevation and topographical data. I kept stopping on this stretch thinking that we either had a monster headwind or my brakes were rubbing. I could have taken my bike and tossed it in the desert at this point but Danny kept me calm and stopped with me multiple times to allow me to rest. I just couldn’t figure out the problem and wondered if my body was failing. I hoped my ride wasn’t going to end sooner than planned. A little after dusk we climbed into Eureka and after asking around, we found the room a little north of the convenience store. It was the worst room of the trip but it was warm and clean. I walked back to the store after I took a shower and grabbed a couple of beers, an 800 kcal burrito, and chips/salsa. After a lot of difficulty (due to a sore mouth from having to eat so much food every day), I ate my bounty and fell asleep. It was the end of a psychologically tough day but that is just the way it is on the Pony Express Trail. As tough as it was for me it was much easier than walking across that vast desert like thousands of people did during the California gold rush. Morning came quickly and got a pretty good breakfast and some advice on our day. The lady working the convenience store told me of the problems we may run into on our quest to Fairfield. We took her advice, climbed out of town and were soon screaming down hill for at least 10 miles. I now understood the problem of the previous day, we had gained a lot of elevation, despite not knowing it. We overshot Hwy 68 but turned back after getting to Goshen. The view of Lake Utah was wonderful on this sunny morning and we could even see Provo on the other side of the lake. The roads were nice and the traffic was light. How could a day get much better? After getting to Hwy 73, Danny stopped at Epic Biking and picked up a “real” headlight. He had been suffering with poor lights since the second day when his light died. If we would have to ride more at night, he should now be able to do it safely. Hwy 68 and 73 was full of construction (as were most of the roads in this area), after going a few miles towards Fairfield, we were turned around by road workers who said the road was far too narrow for bikes to mix with all the trucks. I wasn’t sure what to do at this point, as Fairfield was set up as one of the few required controls for the ride, but decided to turn back and call Edward Robinson tonight. I later found another bike shop and stopped and grabbed a couple of tubes to replace those we just used for my two punctures in the construction zone. Their response to a couple of stinky old cyclists was pretty cold (as opposed to Epic Biking). I guess we were not cool racers, so we didn’t deserve their attention. Look ‘em over with care. Salt Lake City was not nearly as bike friendly as I suspected it would be. I did pick the most direct route in to and out of the city, but I couldn’t complain about the drivers as they were very patient and considerate to us. We found the exit to Interstate 80 and started the long climb out of the valley toward Wyoming. It wasn’t an optimal time to be riding the shoulder of a major interstate (4 pm on Labor Day weekend) but I felt much safer than I do on many two-lane roads in Missouri. It really didn’t take us long to exit the valley with the strong tailwind. 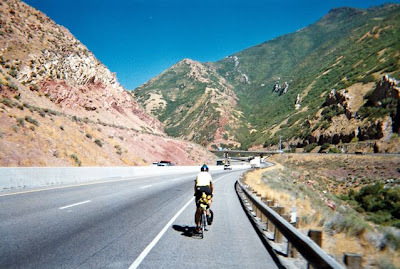 After we made it to Coalville, Utah we both felt like riding further but I was scared to be on the shoulder of a busy interstate in the dark. Danny understood my concern and decided not to push me to continue to Evanston, Wyoming. A cool morning welcomed us (39°F) and the threat of worsening weather got us on the road early and kept us moving all day. We entered the Cowboy state with frozen toes, sunburns, and a nice cross tailwind. Soon we saw many of the wind fences that are all around the major roads in the state. We were soon treated to amazing views of buttes, wind farms, and vast barren lands as well as a shoulder littered with steel belted tires thrown from trucks. I listened to the Wyoming/Ohio University football on the radio and enjoyed the warm sunny day. After calling ahead for a room in Farson (I had to give a credit card or else the owner wasn’t going to wait up for us to get in since it would be past her bedtime) we headed north on busy Hwy 191. Despite my packing problems, we completed our 190 mile day in Farson before 11 pm. We really enjoyed the sunset and the other wonderful scenery this evening. Upon entering Farson and trying to find the hotel, we came across a local gentleman and were told that nothing was open for food tonight, but the convenience store would open at 5:30 am. We awake later today (5:30 am) as our morning routine had become much more efficient. We knew exactly where everything was on our bikes and really didn’t have to think about the process. We headed to the convenience store for supplies to carry us the 77 miles over the continental divide. When we arrived at the store we found the lights off and the door locked. Funny, it was almost 6 am and nobody was there. I jotted down some notes and reviewed the maps to pass the time. After about an hour I headed back to the hotel to see if anyone was there, as I needed to fill my water bottles. I found the owner and thanked her for leaving the room open and asked if the store was going to open. She talked about the oil and gas boom in Wyoming taking away workers with any ambition. She said the store should be open but they probably just overslept or didn’t have enough desire to come in and open up so early. I told her of my water problem so she took my bottles and filled them up in the café (closed on Sunday) since the tap water was loaded with sulfur and smelled like rotten eggs. I conferred with Danny about how much food he had, as I only had about 400 kcal of peanut butter crackers. He had a little more so we pooled our change to buy three cans of Mountain Dew and were about to head out of town when Danny stopped to talk to a hitchhiker. To my amazement, Danny gave him some of our inadequate food supply and a few dollars. I about fell off my Brooks saddle as I watched him. I generally need about 200 kcal per hour and it would probably take up to 6 hours to get to Lander, and he was giving our food away. Do you dare to say out? Do you dare to go in? My spirits for the trip were near an all time low when Danny pointed out a yard sale sign and asked me, “Do you think they are selling donuts?” I didn’t say much as it was about 7:30 am on Sunday of Labor Day Weekend, the chances of that would be next to zero. As we approached the house we saw a few cars and people moving around. Danny hightailed it down the sandy driveway and asked the young lady if she had any food to sell. She gave us a shocked looked and I felt the answer was going to be no. To my amazement she pulled out a couple of boxes of generic fruit bars and a large bounty of Gatorade. I was in shock as I donated money to her sale and stuffed my pockets with the generous gift. I still can’t believe that Danny pulled this one off. He was absolutely amazing in his ability to charm people and find a way out of a dreadful situation. We left without getting her name or address, but I did snap a quick picture of her house. Danny began to talk about how this trip wasn’t about the feet climbed, miles ridden, or the weather we overcame, but the people that we met. My eyes began to tear up as I realized that he was 100% correct. It was the people along these barren roads that helped us day in and day out. It was the only way we survived and the only way the pioneers were able to cross these bleak lands. I headed down the road in silence amazed at the scenery that now surrounded me. The next seventy some miles were amazing. We were in the area of South Pass where all the major wagon trails (California, Oregon, Mormon) crossed the continental divide. It is a 20 to 30 mile wide stretch of land that is only covered with wind-blown scrub brush. I could see the snow-covered Rockies to the north and wagon ruts to the south. The grade was gradual and the winds were strong. I felt tiny and humbled by all the history that had taken place around me. With the extra food, we made it to Lander and had a large, late breakfast. Danny struck up a lively conversation with a couple that was from St. Louis. I mostly sat eating, looking at maps and listening to their conversation. Danny was having a great time and I was getting a little relaxation. I didn’t have to try to explain our trip in a way that didn’t make us sound completely crazy. We stocked up on food, liquids, and salt and headed north to Riverton and then on to Shoshoni (we avoided the Sweetwater route which the Pony Express ran due to it being more than 150 miles without any services). The Red Canyon and the Wind River Valley were amazing, but nothing compared to the luck (or Danny’s skill) of getting enough food to get us over South Pass. We awoke, packed up and quickly headed back over to the Desert Café for breakfast. Dinner was great last night and the café was close to our hotel (Desert Inn Motel); in my mind, the perfect combination. Our string of wonderful weather appeared to be broken as it was raining quite hard that morning. A quick check of my weather radio told me that this was predicted to last the rest of the day. Danny was not happy about the rain but as long as it wasn’t pouring or lightening, he agreed to ride. After breakfast we headed to a store for supplies, for it was 99 miles to Casper. We were on the road by sunrise. The rain was coming down pretty hard and from the look of the landscape, it was greatly needed. After 41 long miles we came across the “city” of Hiland (population 10) which had a small store. We were in luck to find it open so we could change our wet socks and get a warm drink and snack. I prodded Danny out the door after about a half hour. I started to get hypothermic because of sitting around. Luckily the rain was slowing down now but tons of recreational vehicles with boats started flying down the road toward Casper. It must have been the campers heading home early from the Boysen Reservoir because of the bad weather. I know people complain about the price of gas (over $4.00 per gallon around here) but the number of massive vehicles on the road tell me that most people could afford even higher prices. At about 2 pm we finally made it to a truck stop just outside Casper. We jumped at the chance to go inside a warm, dry building and have a warm drink. Danny chatted with the workers as I checked out some books and maps. I soon found the route through town and we were off for a late lunch at Ihop. The meal was nice but Danny was a little upset that it took so long to get the food. I think he would have rather hit the golden arches, but it was a couple miles off of our path. We were not interested in any bonus miles at this time. After leaving Ihop, we found the storm had just passed over us and the wind had now turned into a tailwind. We cruised with full bellies, a drying road, and a little push from behind. We passed through Glenrock (Rock on the Glen) before joining a deserted interstate highway on our way to Douglas. Despite wanting to push further than 155 miles, we decided to stay in town because the next town, Torrington, was still 95 miles away. This turned out to be a good decision because the Plains Trading Post had the best chile rellenos I had ever eaten, as well as a good supply of Blue Moon beer. Having made it past Casper (> 1,200 miles), we started having very honest discussions about how we both wanted to quit in Nevada. We also talked about our families and how much we missed them. I revealed my problems with my memory as I had lost most of my ability to do math in my head. Soon the whole conversation became painful and it just ended in silence. We got the bill and headed off to bed as tomorrow would come very soon. Much needed uplifting song for the day: “Feelin’ Stronger Every Day” by Chicago. We left at sunrise with a mild tailwind and a temperature of 44°F. 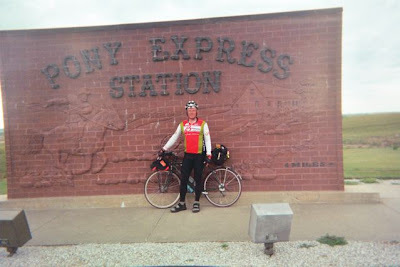 We continued to follow the Platte River and reached Torrington by noon, but quickly pushed on because we needed to be in Mitchell, Nebraska before the post office closed. This was the place where I sent extra tubes, tires and other supplies just in case I needed them. I had six punctures on my balding front tire so four new tubes and a tire was desirable. The day warmed up and we were blessed with a light cross wind. For the first time since California, we dropped to less than 4,000 feet in elevation. At 3 pm we reached Mitchell and I skipped into the post office for my package. When I asked for it I was told that it didn’t make it there. I explained to the clerk when it was sent and why we needed it, but after checking again, I was told it was not there. I left the post office and the look on my face told Danny that there was a major problem. My only thought was to call Bob and see if he had a receipt of the zip code the package was sent just in case I made a mistake and mailed it to the wrong place. When I went back into the post office to ask for the nearest pay phone, the clerk said she would check one more place. A few minutes later she came around the corner with my package. What a relief! We were back in business. I pulled out what I needed and mailed the rest back home. We ate at Subway and were down the roads toward Scottsbluff. It was amazing at how much greener the land was and we were now starting to see fields of corn and beans along the highway. I was told the only way agriculture was possible here was due to the massive Ogallala aquifer located below us. After Scottsbluff we headed south to Hwy 92 so we could get a closer look at the rock formations of Jail Rock, Courthouse Rock and Chimney Rock. These were very important landmarks for the pioneers as they headed west. After 160 miles we finally pulled into Bridgeport, NE. We wanted to push on further because the weather forecast was for 20 to 30 mph headwinds the next day but I just didn’t feel like riding further. We found a nice hotel in town and were so tired that we got junk food and ate it in our beds. We grabbed more junk food and stuffed it in our bags and got out of town before sunup. The towns were a bit closer together and we ended up making pretty good time as the wind was probably blowing only 15 mph out of the SSE. The headwind put me in a really nasty mood so Danny and I didn’t talk much. I found myself talking to the animals grazing in the fields and really thought I was loosing it when I caught myself humming a Bob Seger tune. When we got to Lake McConaughy, we were then diverted into the bluffs and I enjoyed the chance to stand up and pedal. The lake was man made and I learned they were having trouble with low water levels and silt was filling in the lake from the sandy landscape. We took a nice lunch break in the cow town of Ogallala. We later crossed into the central time zone and finished our 145 mile day at a hotel in North Platte. As we left in the morning the temperature was a frigid 37°F. The day soon warmed up but Hwy 30 started getting busy. Thank goodness for the wide shoulder even though the expansion joints gave us a rude jolt every two to five seconds. Danny’s suggested schedule of riding 60 miles before lunch, 60 miles before dinner and then bonus miles in the evening started to work out well. The towns were much closer and it allowed us to get more miles in the evening if we chose. The day warmed up into the lower 70s and we finally turned south off of Hwy 30 near Kearney after we gorged at the Pizza Hut buffet. It was really a beautiful day to ride but the dead flat landscape started to get to me. I could see why they liked to bring wagon trains through this area but all this sitting was starting to give me a case of crabby pants. We reached Minden in the late afternoon and we started asking around about hotels. The route we planned to take was deficient of any lodging so we again went to “plan B.” Danny seemed to prefer that we shoot for Blue Hill since it would get us a little further down the road (160 miles for the day) and would avoid backtracking. I was all for that suggestion. I had begun to notice that if something was more than five feet of the road and we didn’t need to eat it, drink it, or sleep on it, we just didn’t go anymore. As dusk neared we pulled into The Blue Hill Inn after a glorious evening of cycling, telling bad jokes, and taking to animals. We were directed into town for a place to eat and as luck would have it, made it there 15 minutes before they closed. I got a couple of tasty beers from the bar and ordered a good meal. Danny entertained the locals with his stories of the road while I checked out maps and again attempted, with great difficulty, to calculate the miles we had left in our adventure. Danny later turned toward me and started talking about what he wanted for his funeral and what he still wanted to accomplish in his life. I did my best to share my thoughts on these subjects but being so homesick, yet not wanting to be done with this ride, tore me up and made it hard to concentrate. I finished my meal and beverages and we rode back to the hotel talking about what a wonderful town this was. Alone will be something you will be quite a lot. you’ll meet things that will scare you right out of your pants. We packed and started down a wonderful two-lane Nebraska road. As I started to get hungry we were passing through the little town of Nelson. I smelled the heavenly sent of fresh coffee. I begged Danny to stop and we headed inside. He didn’t seem too happy because they didn’t have the incredible edible egg on the menu, but I talked him into staying for waffles, coffee and a massive cinnamon roll. I felt like I was in heaven as I savored the vanilla latte and gorged on waffles. While eating, the owner took down our names and Danny filled her in on our story so she could put it in the local paper for all the Pony Express buffs in the community. A bit bloated, but extremely satisfied, I hopped on my bike and headed off to Fairbury. After getting to Fairbury and finding out they didn’t have a McDonalds nearby, we again gorged at the Pizza Hut buffet. A waitress who had just moved from Green River, WY freaked out when we told her we biked from her old town to her new town. After getting over that shock she gave us good directions down Hwy 8 (which follows the Little Blue River) into Kansas. At this point of the ride I began to realize that the only time that I could relax was when I was cycling. The rest of the time was filled with required tasks of eating, packing, unpacking, map reading, getting brevet cards signed, etc. When I was on the bike I felt my best. I could listen to the radio, the news or just space out looking at all the new scenery. Soon we were in Marysville, KS and grabbed a few supplies before we headed down the road another 30 miles to Seneca. The extra 30 miles for the day would allow us to finish a little sooner and Danny could get back to Columbia, Missouri to see his family. The evening was again quite magical as we saw vast fields of sunflowers. The hills started to roll and we were able to get up off our butts. We entered Seneca and got a hotel and headed to yet another buffet (I was starting to see a pattern here). I got back to the room and made a few phone calls, iced my knees and listened to the weather before falling asleep in a strange bed for the last time on this ride. We got up at the usual time, grabbed our convenience store breakfast and hit the road before 7 am. We were treated with a wonderful sunrise and calm winds. The sky was red and all the fog made it seem like we were in some mystery movie in England. After reaching Hiawatha, Danny inquired about places to eat and we were directed to a diner in the hotel right by the highway exit. Like most days, the local farmers/ranchers were interested in our trip. Danny did a great job fielding their questions and it gave me a few minutes to do my thing. We ate our wonderful breakfast and thanked the cook before heading out for the last 44 miles of our journey. It all seemed so strange to be on a highway that I was familiar with after 1,900 miles of strange roads. Soon we saw a local cyclist, Jack Romans, who rode out to give us some company on our last leg. We welcomed his company as Danny and I have talked about everything that I could possibly think of. We both took turns chatting with him and soon we crossed the bridge into St Joseph. At that time, my emotions really started to overwhelm me. With my eyes tearing up, it was a bit hard to see the road as we made our way to the Pony Express Museum. We got the last stamp on our brevet cards to complete the ride (13 days, 3 hrs, 30 minutes) and were greeted by a few local cyclists who heard of our “early” arrival. Danny and I were able to tour the museum (which now means so much more than before we left) before heading out for the “staged” arrival in downtown St Joseph. It was great to be welcomed home by family, local cyclists, coworkers, and other people of the community. With the exception of Paris-Brest-Paris, randonneurs are never greeted by more than a couple of people as we end a ride, it was amazing what St Joseph did for us. You’re off toe Great Places! As Danny said, two weeks is a long time to be doing any single thing. The ride was long and hard with over 95,000 feet of climbing but the logistics were the biggest challenge. It was amazing to see the vast barren lands that so many pioneers crossed on their way to the west coast. In my mind, I was most amazed at the stretch of the Central Overland Route from Salt Lake City over Carson Pass. It was a route that Howard Egan developed to drive livestock between Salt Lake City and California. The amazing thing was that it was so counterintuitive as it led straight through the high mountain ranges that earlier explorers had worked so hard to avoid. We were lucky with the weather as high temperatures and severe storms were ahead and cold temperatures and snow were behind as we crossed Wyoming and western Nebraska. The people we met on the ride were amazing and I never felt threatened a single time in two weeks. It may seem that this ride is all about Danny and me (or that is the way I told it) but we would have never started if it weren’t for Bob Fitzpatrick, our understanding families, Heartland Health (my employer), The Mark Reynold’s Fund, Bob Burns (Kansas City RBA), and our training partners. Inspiration from Robert Fry, and advice / moral support during the ride from Edward Robinson. To all of you, I am forever in your debt. …and how they did it through that barren land, I will never understand. I enjoyed reading about your Pony Express ride in the current RUSA publication. That's awesome! I also love how you left out all the statistics that most writers / riders make the focus of their "I was there" stories, such as how long it took, your total mileage, average speeds, and such. I am curious, though, what kind of gear your carried, and how you carried it, and what you had to do to "prove" you road the route to the presumed "route owner." We have a new, really neat century in Death Valley in April. Maybe you can ride out for it! if you do, we'll waive your entry fee! Thanks for your note and I am glad that you enjoyed the story. As you noticed, I did intentionally leave out all the numbers. For some reason, it doesn't mean a lot to me (how fast I go) as long as I get done in the required time. A few years of college track made me realize that there are tons of people faster than me but if I am in the right frame of mind, nobody can enjoy a bike ride or a run more than me. • I had a Trek 520 with a front rack and a Carradice saddlebag. • I had a Carradice rack pack on the front rack with a spare tire, four tubes, chain lube, cables, a few wrenches, and tire levers. • I brought two changes of clothes plus arm warmers, extra wool jersey, leg warmers, rain jacket, wind vest, wool cap, and winter gloves. • Had a bivey, cut down sleeping pad, loose nylon shorts and a light t-shirt. Also, a small weather radio that was very valuable. • As a back up, I mailed a package to a post office on the Nebraska / Wyoming boarder with extra tubes, lube, cables, and a tire. I needed it all! 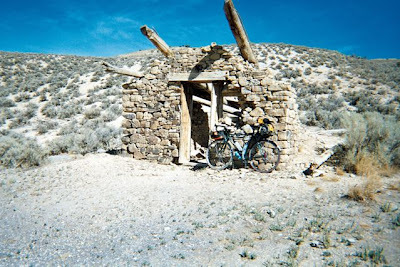 • Danny packed a bit heavier but mailed back two extra sets of clothes and the heavier tools before we got out of Nevada. To prove that I did it, I did a few things. First, since it was a permanent, I got a two to three register receipts each day that were dated and timed. I also carried a SPOT and sent a link to the permanent coordinator (Edward Robinson). I also contacted him a few times along way to be sure everything was looking good. In addition to that, I called in from the road (just about) every day to give a report to the local newspaper. They ran a few stories in the local news as well as put up a blog that broadcasted my SPOT position. Keep up all the good work in Death Valley and Southern California. I really like the things that you do. o me, it was a bummer that you couldn't pull of the adventure racing* that you were wanting to do. In my simple mind, these long permanents are the closest thing to what you were attempting to do. 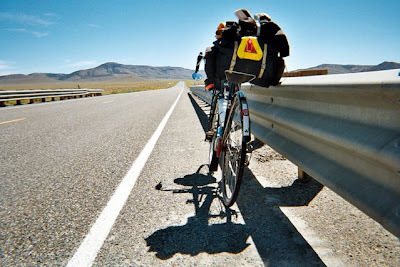 I am sure a lot of my inspiration came from thinking about that event (transcontinental route). * A self-supported transcontinental race which we had planned to produce a few years ago, but which is still on the back-burner for the future. See www.transamracing.org. Yo, ho! On to St. Jo! First off - loved the use of "Oh, the Places You'll Go." The rest of your report had me on edge just wondering if you were not going to starve! But amazing account of a wonderful ride. Truly epic. I'm so glad I peeked over here to read this today. Great story, Spencer. You and Danny are the best. Wow.